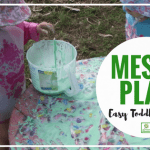 I love the benefits of providing messy sensory play opportunities for children in the early years! 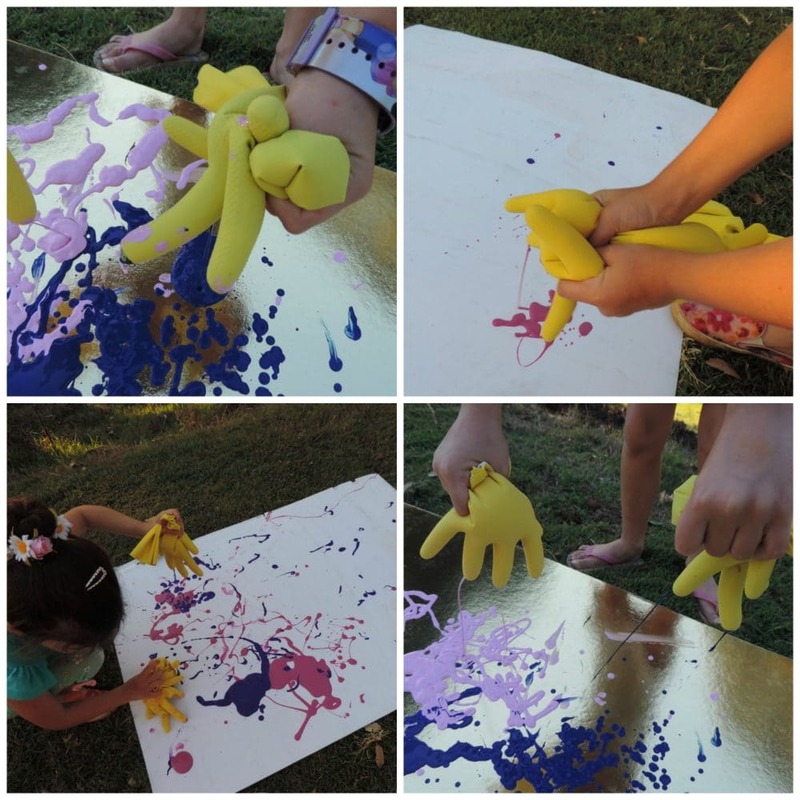 This simple activity was certainly a hit with the children and it led to a whole lot of wonderful creative self expression not only using their hands but also the rest of their bodies. 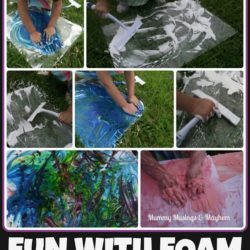 You will definitely want to do this one outside because it does end up rather messy but that’s half the fun and if you can step back and not worry about the mess and clean up you will be rewarded with some very happy children who are learning through their play while exploring with their sense of touch. There are many opportunities for intentional teaching moments here if you allow yourself to join in the fun too! It is very simple to set up and requires only a few materials that I’m sure you already have in the cupboard at home. Let’s take a look at how we played…. 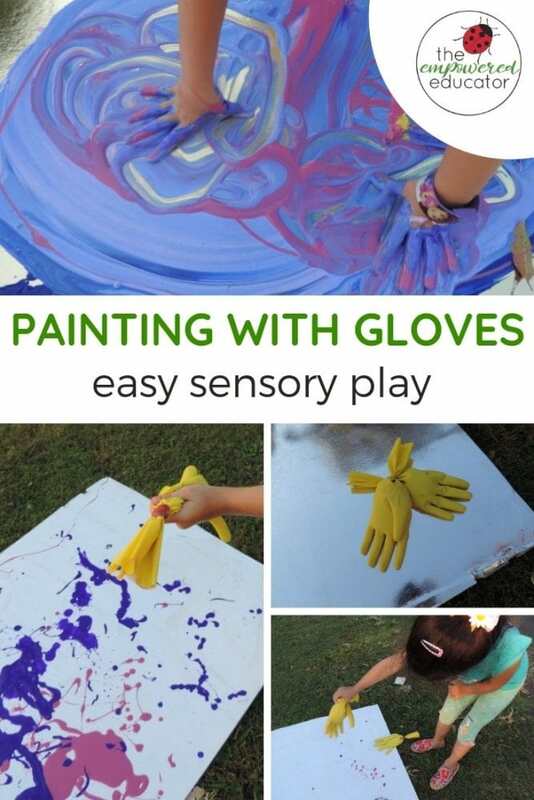 What Do I Need For Sensory Glove Painting? Poster or craft paints – slightly thinned a little with water – mix well. 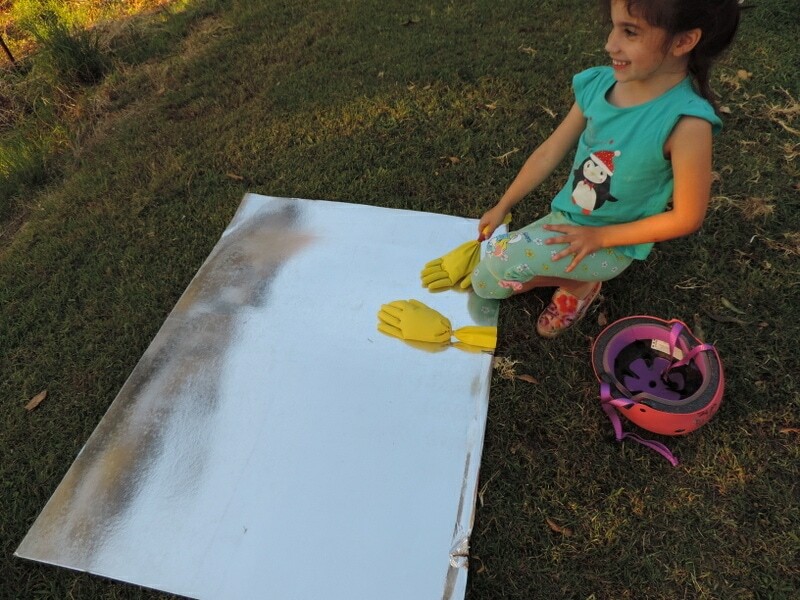 A large sheet of cardboard (we used some old packaging boards but you could also cut up some cardboard boxes) Paper will not work as well as there will be quite a heavy quantity of paint and you want the children to be able to get in there with their hands as well and paper will rip. That’s it. I told you this one was simple and budget friendly! 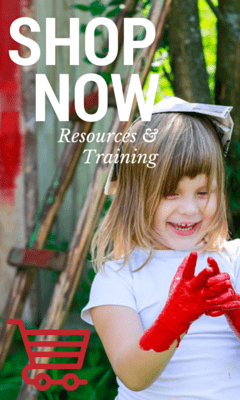 What Do I Do Now for Sensory Play? 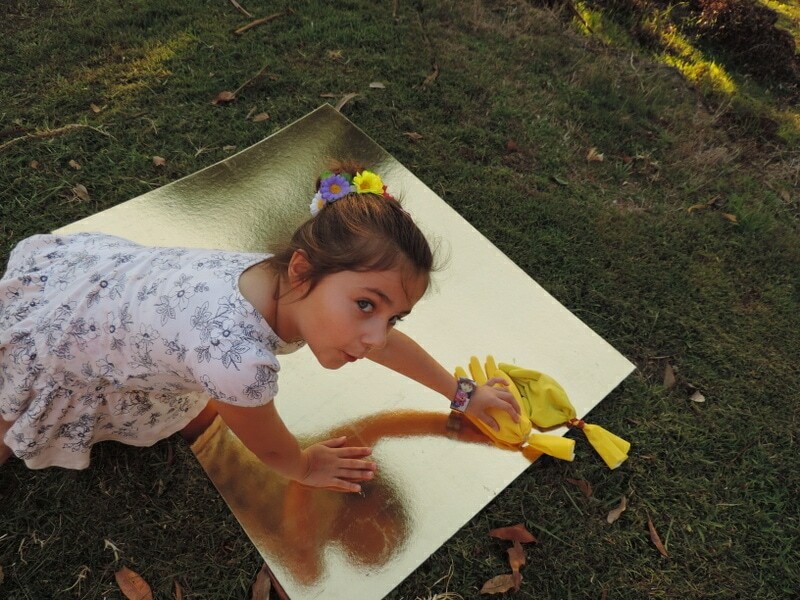 Find a nice area outside to lay down your cardboard sheets – I suggest somewhere close to a hose or bucket of water you bring out for washing hands -this is especially important for those children that like to regularly wash their hands when they feel they are getting to messy before coming back to play again. Take your gloves and half fill with your watered down poster paints (if you make it too runny the paint will come out to quickly – you just want it thin enough that it can be squeezed out of the holes by little hands – you might need to experiment a little depending on the ages of the children you have in care) Decide how many colours you want to use – it will obviously depend on how many gloves you are using! 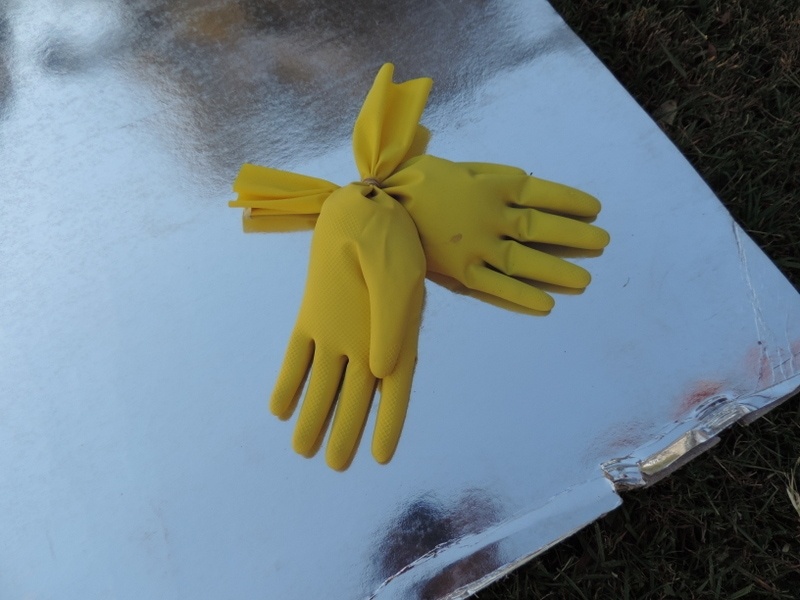 Use your rubber bands to secure the paint inside the gloves as shown below. 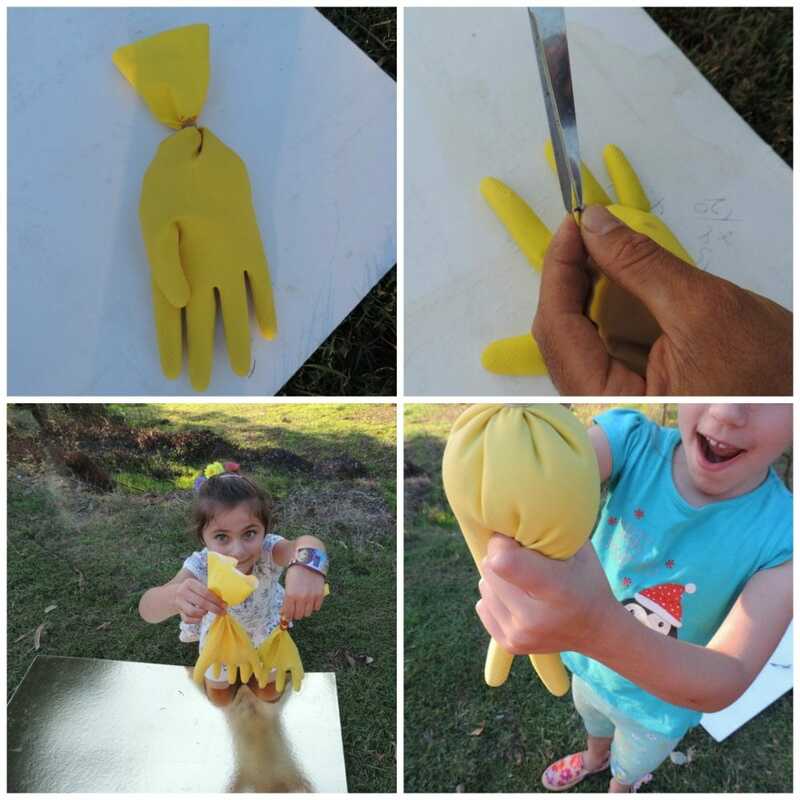 At this stage you might like to pass the gloves around and encourage the children to squish and tell you what they feel – is it soft or hard? Squishy? Smooth? Take scissors or a sharp cake skewer and make a small snip or hole in each end of the glove fingers. You can do all of them or only a few if you would prefer to extend the length of the activity a little. 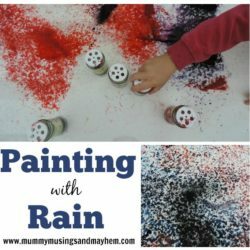 If you are doing this activity with toddlers I would suggest putting holes in all the fingers and making the paint run quickly. Make sure you are ready to go before passing out the gloves because it will get messy fast! I like to place the cardboard down low so that it’s easier for younger children to access but also because it allows the opportunity to use their full range of motion and give those gross and fine motor skills a workout! Now aim for the cardboard and squeeze! 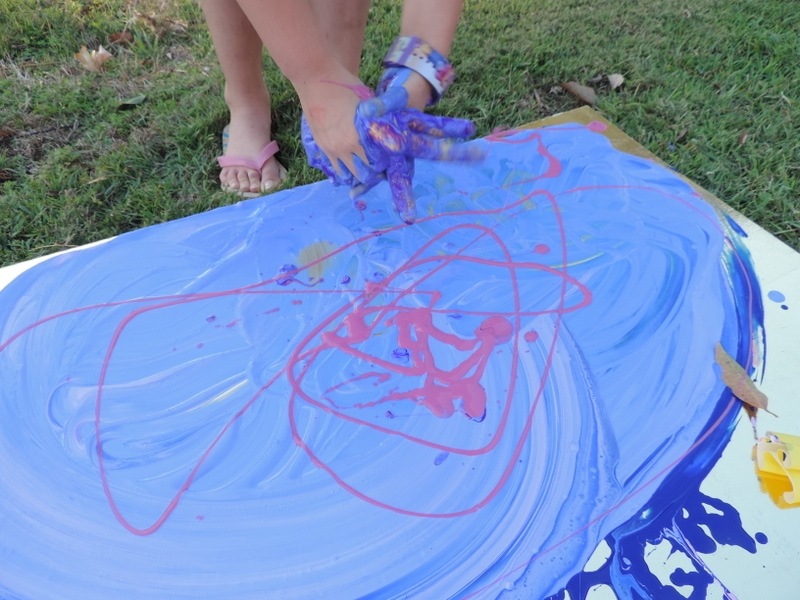 Toddlers and younger children will just enjoy the sensory experience of squeezing and making colours appear on their canvas -older children will also enjoy the aspect of making patterns and mixing colours. 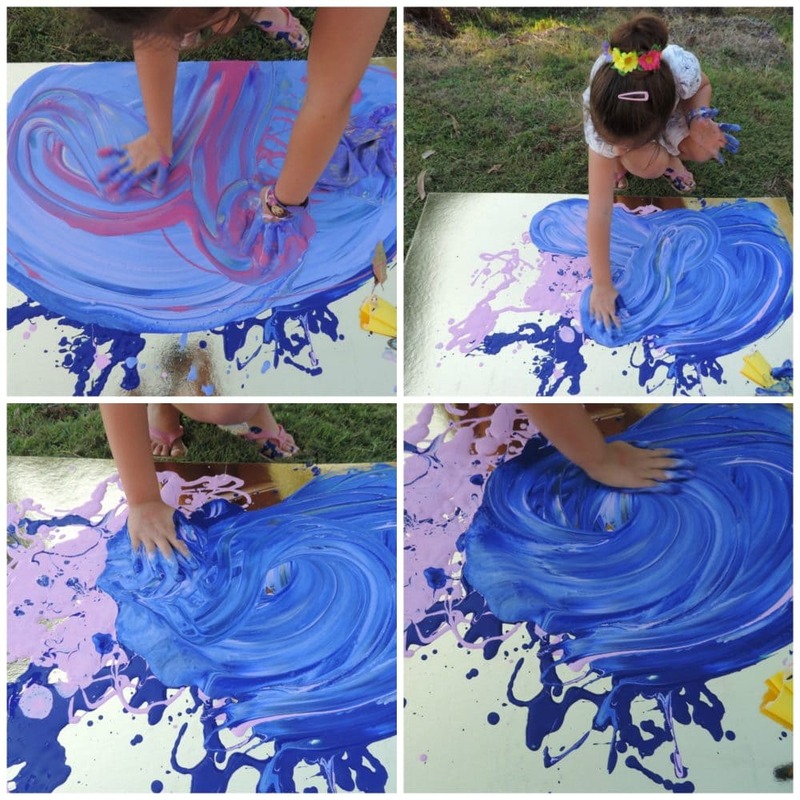 You can also prompt them to squeeze harder or softer to investigate how that affects the flow of the paint and how it looks on their art. 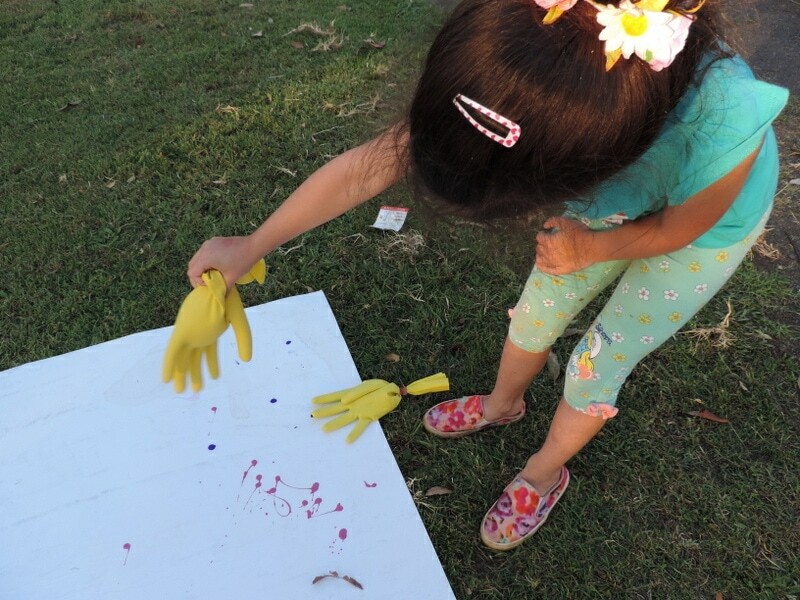 Because you are using quite a big volume of paint in a short space of time you will want to extend the activity a little by encouraging the children to continue the self expression and sensory experience by getting those hands into the paint when the gloves become empty.We also used the empty gloves as a painting tool to make big sweeping smudges through the paint. Time for some glorious colour mixing and mark making fun! This activity also provided a fantastic opportunity to get that body moving and creating while having fun outside. 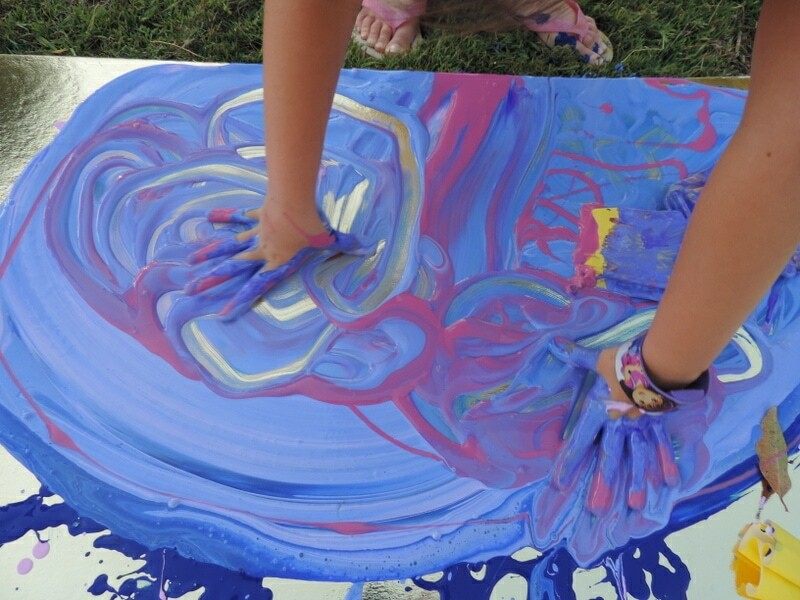 Not all painting needs to be seated at a table – sometimes you just need to paint and create with your whole being! What’s not to love? 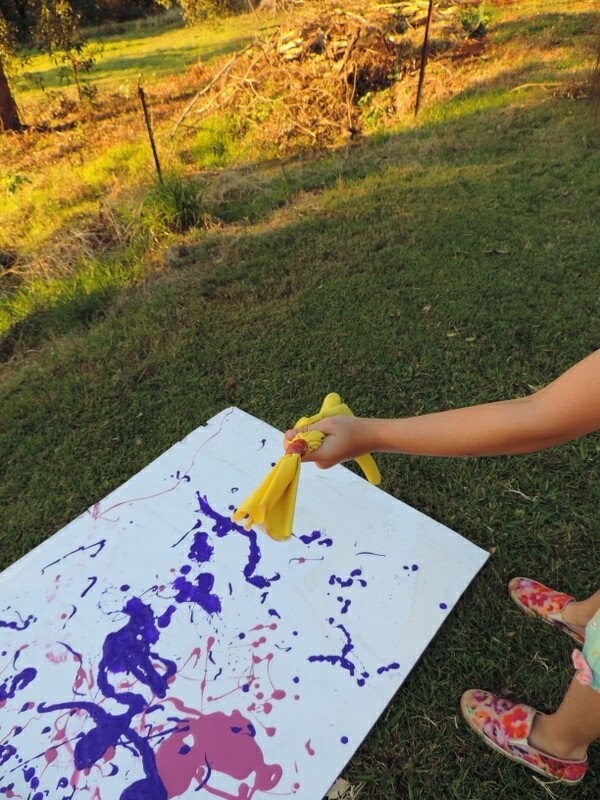 I’d love to see your pictures if you try out a little glove painting with your children – stop by and join my Empowered Educator Community on Facebook – we love to be inspired! Are you on Pinterest? Why not pin the image below to save it for later. 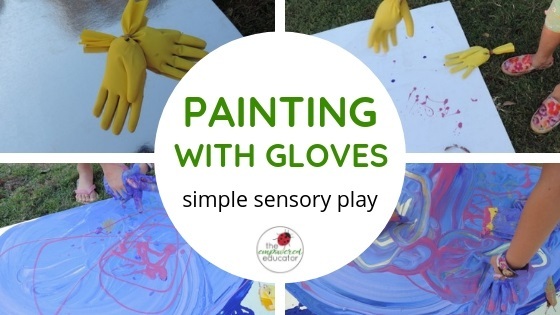 Looking to incorporate more sensory play into your early childhood teaching? 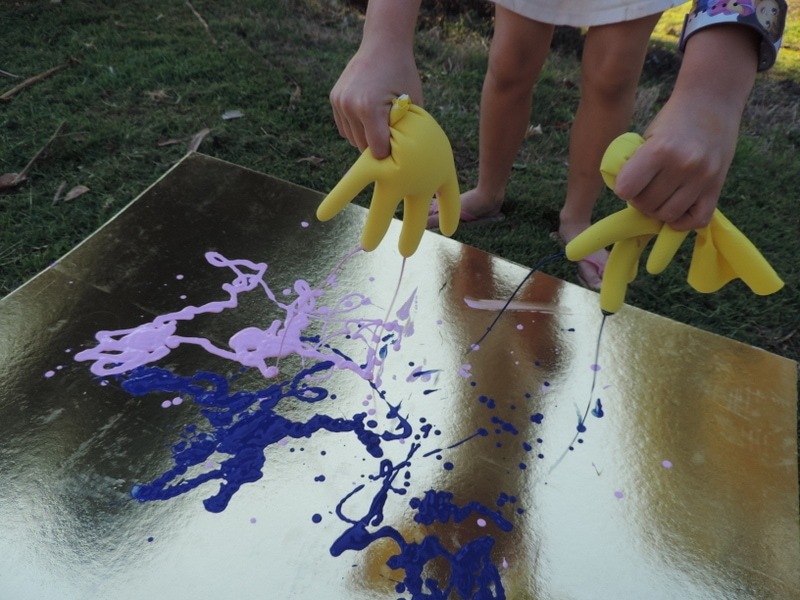 Take a look at my ‘Wonder of Sensory Play’ online training session. 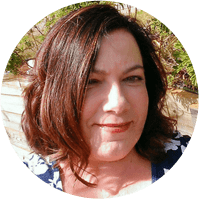 You can watch it when it suits you and it’s packed with inspiring ideas, environments and experiences to increase the opportunities for sensory play! 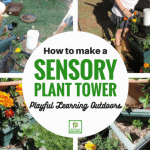 « Sustainability in the Garden – How to Make a Worm Tower! This is such an amazing idea. 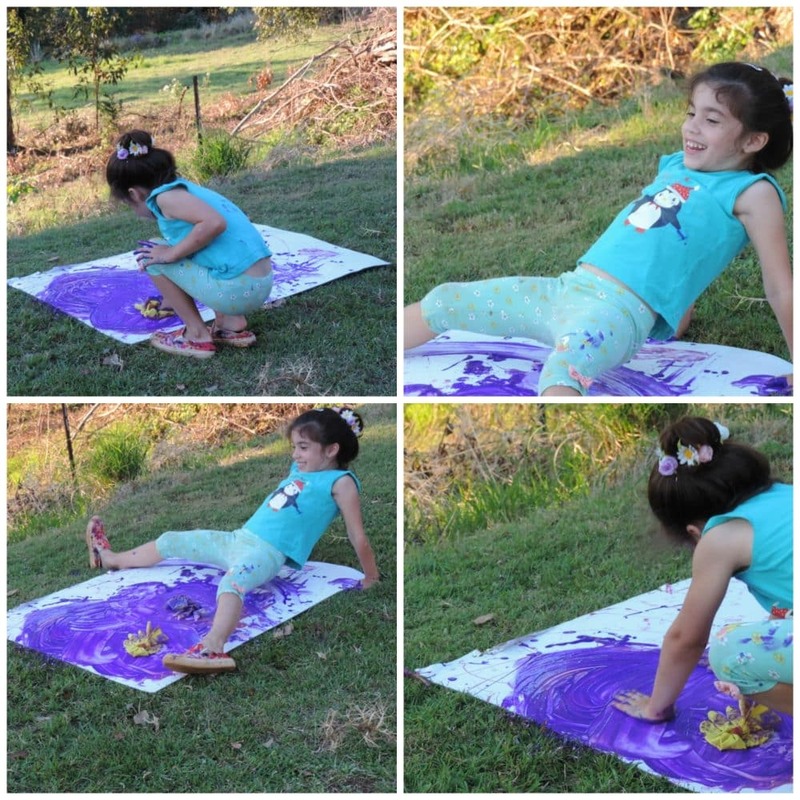 I love the picture of your daughter sitting on the paint. Something my daughters would do too. Thanks Kate, yes she had such a great time, why use your hands? Haha!